The Illinois State University Honors Program promotes exceptional learning for exceptional learners. Admission to the Honors Program is competitive and involves submitting a well-rounded application, including evidence of past academic achievements and community engagement. Participation in the Illinois State University Honors Program begins during the fall semester. Students can persist in the Honors Program by maintaining a cumulative GPA of 3.3 or greater and successfully completing at least one Honors Learning Experience each semester. Congratulations! 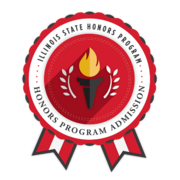 This badge recognizes your admission to the Illinois State University Honors Program. Your first semester in the Honors Program commences with participation in an Honors Learning Experience, specifically the Honors Mindset Seminar, during the Fall 2017 semester.